Murder by Gaslight: A Christmas Poisoning. It would have been an act of contrition for Mrs. Paye to bake her husband a pie. They had just recently reconciled after a very tumultuous month. David Paye was a 44-year-old Hudson River boatman who was planning to retire from the river due to rheumatism. About four years earlier he had married 18-year-old Mary Ferguson, daughter of a brickyard laborer, and two years later they had a daughter. All seemed well with the marriage until Capt. Paye began to feel the effects of a life on the river. As he spent more time at home he began to suspect that his wife was unfaithful. Captain Paye confided to his friend, J.D. Tallardy, that a young man named William Crawford would come to his house when Paye was out and stay with his wife until late at night. Sometimes she would meet Crawford at the house of Allen Horton where Crawford boarded. Paye said once he had gone to Horton’s looking for her and found Crawford lying with his head on Mary’s lap. In the bitter argument that followed, Mary Paye told her husband that he was not the father of their daughter and accused him of drinking and spending money in the society of disreputable women and made other accusations “not of a character to be published.” She moved out and went to live at Horton’s. Over the course of the following month, articles of furniture and bedding were removed from his house by Mary and taken to Horton’s. In spite of his anger, Capt. Paye pleaded with his wife to come home. She finally relented after they both signed a written agreement, in the presence of the Justice of the Peace, stating the conditions under which she would return. One of the conditions was that he not make trouble for her because of an alleged forgery of his name to draw money from the bank. Mary returned to her husband, but it was not a happy household. A post-mortem examination of Capt. Paye’s body confirmed what the doctors had suspected, he had died of arsenic poisoning. The coroner’s inquest concluded that Capt. Paye had been murdered by poison administered by his wife, and Mary Paye was arrested for the crime. The case was brought before a Dutchess County grand jury but there was no hard evidence against Mary Paye. The testimony against her was all gossip and speculation. The jury failed to find a bill of indictment and Mary Paye was released. She was appointed administrator to his estate, amounting to a few hundred dollars. “Brief Mention,” Port Jervis Evening Gazette, February 12, 1883. “Mrs. Capt. Paye Arrested.,” The Sun, December 30, 1882. “Mrs. Paye Discharged,” New York Times, January 6, 1883. “A Mystery,” St. Louis Post-Dispatch, December 28, 1882. “The Paye Poisoning Case,” The New York Times, December 29, 1882. 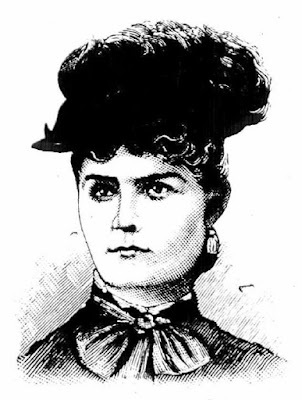 “A Woman Under Suspicion,” National Police Gazette, January 20, 1883.